Everybody needs tokens. My Tokens allows including dynamic content from database or Http Requests (could be Web Services) in static places and are also very useful for achieving seamless integration between otherwise isolated components. Maybe the best way to describe MyTokens is to think of it like an Integration Framework. My Tokens allows you to use predefined DNN tokens and new ones such as: Session, Cookie, Get or Query String, POST data, Host, User, etc. 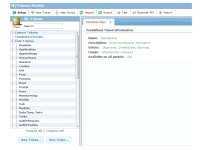 What's more, you can create custom tokens from Database, File System, HTTP, FTP and Mail Servers. My Tokens features API to easily export data for integration with other components such as other websites, Desktop Apps, Mobile Apps. Well, if you want to extend support to all modules that already support standard token replacement, then you can configure My Tokens to patch the DNN core. 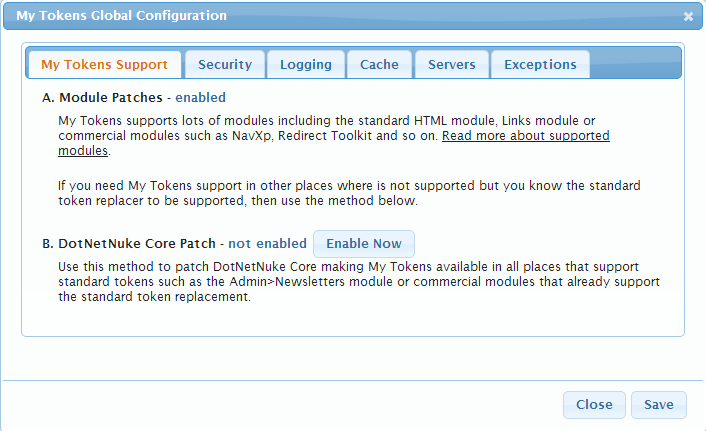 If you don't patch the DNN core, My Tokens will still work with a lot of standard and commercial modules. 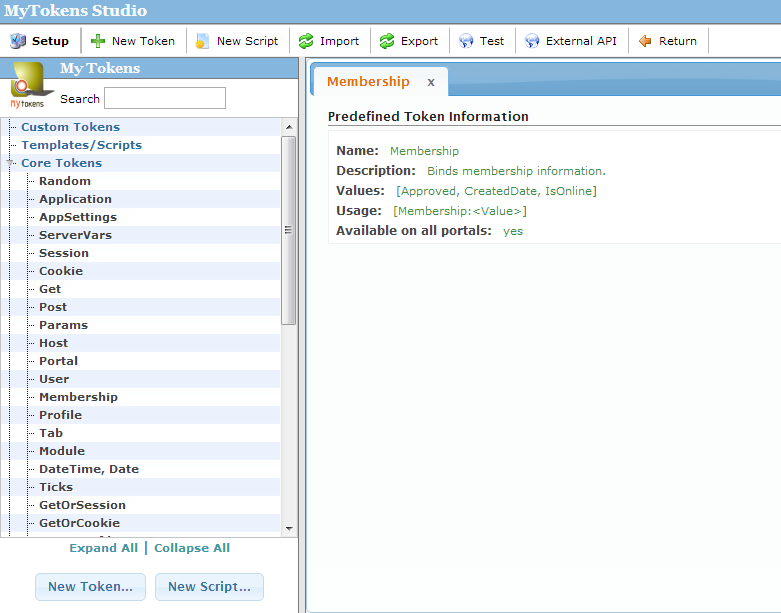 MyTokens inherits all token sources available in DNN (Host, Portal, User, Membership, Profile, Tab, Module, DateTime, Ticks). Starting with version 2.0, My Tokens supports Razor scripts so it's now possible to write complex templates with loops and conditions. All custom tokens are available! Same as Razor, Spark is an engine capable of building complex templates. The main difference between the two is Spark is more HTML friendly, a lot of it syntax happens inside tags. 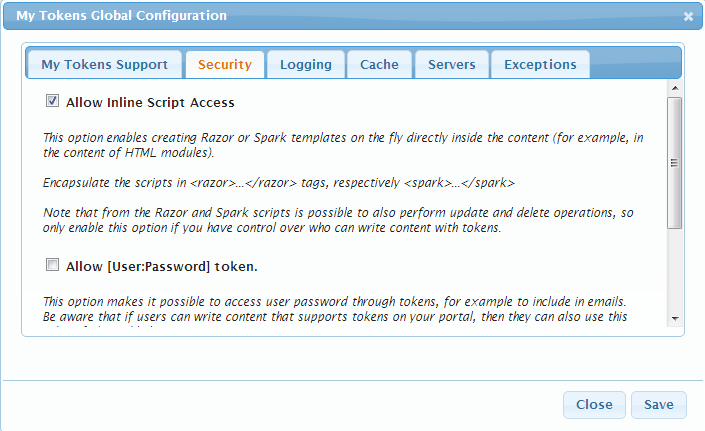 Normally, Razor and Spark templates are built from My Tokens studio the later used in modules (such as HTML module). But it also support writing the templates directly in the content by enclosing them between <razor>...<razor/> respectively <spark>...</spark> tags. Special Tokens that get their value from page state and save it in cookies or session so after page state is lost the token maintains its value; the token are GetOrSession, GetOrCookie, GetOrProfile, PostOrSession, PostOrCookie, PostOrProfile. 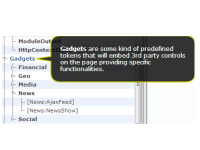 My Tokens provides XML mechanism to define gadgets, that is tokens that result in embedding some 3rd party controls on the page. My Tokens comes with gadgets for embedding YouTube Videos, Facebook Like button, Disqus, News rotator, Currency Exchange Rates, Tweeet button, Google Maps and much more. 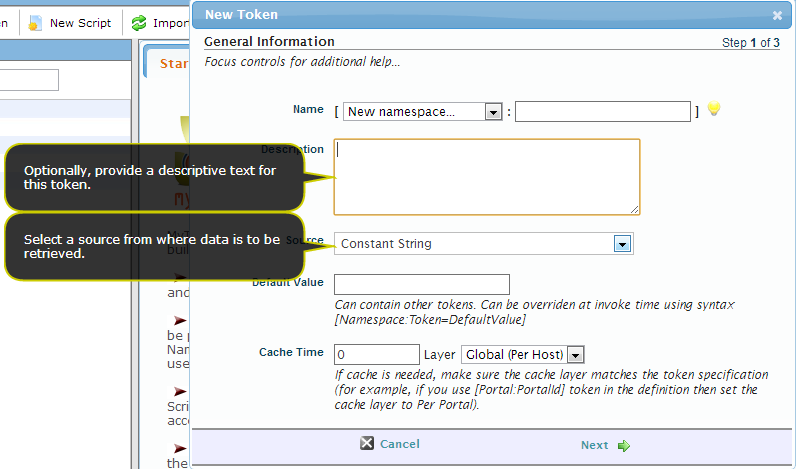 Create new tokens as constant strings or built against Database, HTTP Server, FTP Servers or Mail Servers. Further processing of result is possible with use of Parsers. 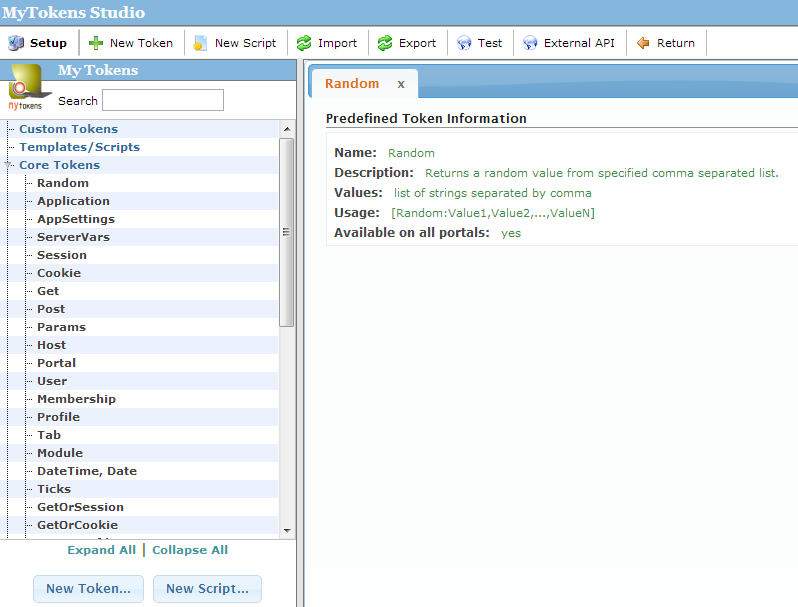 Will run a query and fetch the results in tokens that can be used in any MyTokens aware module. MyTokens will make an HTTP Request and put the response in tokens. 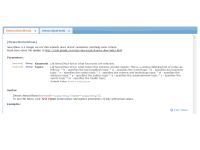 Using the parsers, the response can be interpreted as text, json, xml or stripped using a regular expression. Tokens are built from a file loaded from disk. 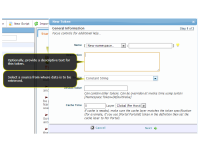 Paths can be specified absolute or relative to website root. How tokens are extracted depends on parsers and rules used. This behaves sames as File System Token except the file is grabbed from a FTP Server. MyTokens can connect to a Mail Server using POP3 or IMAP and fetch email parts (subject, body, to, from, attachment). Currently, it's only possible to retrieve latest email; filters will be added to match emails. 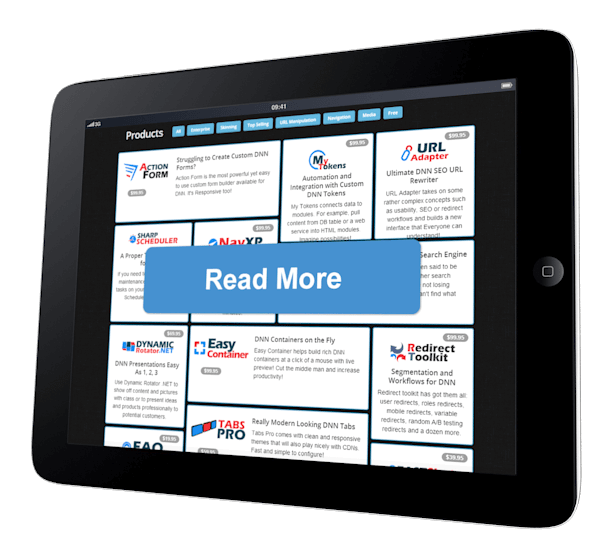 Once data is returned from the Token Source, further processing is made with use of Parsers. My Tokens comes with folllwoing parsers: No Parser (data is left as it is), Strip Xml/Html tags, XML Parser, Json Parser and RegExp Parser. MyTokens will automatically patch some standard modules (even if they're installed after MyTokens). 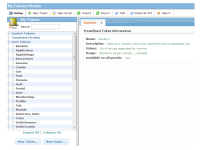 Supported modules are: Text/Html, Links, Announcements, Reports, Documents, User Defined Table, Form and List, IFrame and MLHTML. MyTokens provides a Skin Object that will replace tokens in Skin Files. 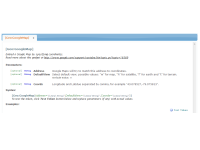 In general, it can be included in any .ascx or .aspx file. My Tokens provides several configurable layers for caching tokens. There are: global (per host), per portal, per role and per user. MyTokens can be integrated with any other module both ways: to replace tokens and to export tokens that will get replaced in other MyTokens aware modules (using the Api or using intermediate storage - database, file system, application collections).